Hardwood and decorative softwood veneers which are the visible faces of hardwood plywood panels are cut from the trunk or root of the tree. The tree is sliced up into thin sheets of wood called flinches. 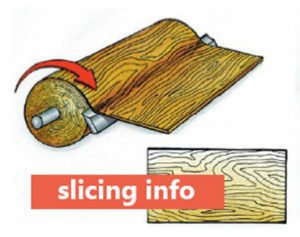 These flinches are then glue-stitched together in various matching sequences (see plywood matching) to create the face and back veneers of plywood panel. The manner and angle of the slicing produces different grain patterns in the flinches creating the final appearance of the panel. Images © Compliments of Saunders Wood Specialties, Inc. 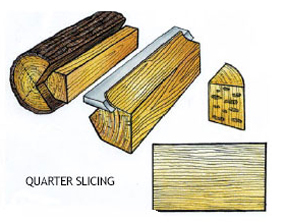 The entire log is cut or “peeled.” It can yield full sheets of veneer with broad grain pattern and no plain or quarter-sliced appearance. This method produces a series of stripes — straight in some woods, varied in others. 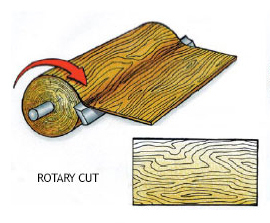 A flake pattern is produced when slicing through medullary rays in some species, principally oak. 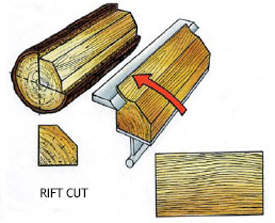 Most species produce the same look as rift cut. 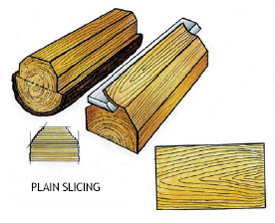 A cut angle of 15 degrees to the radius of the flitch is used to minimize the ray flake affect in oak.